Learn About the Best Way to Broach the Hospice Conversation. At memorial services, staff have asked each person attending to touch the hearts in a basket, “infusing them with their kind wishes and intentions,” before they are presented to bereaved family members. The hearts have also provided uplifting emotional and spiritual “centering” for staff members in their caregiving, explains Betty. These healing gifts, each one different in color and texture, are lovingly handcrafted by SamariTeens, a group of high-school volunteers moderated by Sharon Wenner, Samaritan’s volunteer recruiter and youth volunteer coordinator. 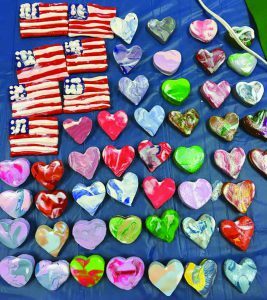 The teens mix oven-bake clay colors, mold heart shapes, and lacquer each piece to give it a shiny, finished look. At the chaplains’ request, some hearts receive glued-on pin backs so they can be worn close to the recipient’s heart.